October 16, 2013 - Lao Airlines Flight QV301 had departed Wattay International Airport in Vientiane, Laos at 2:45 PM today with 44 passengers and a crew of five onboard an ATR-72-600 aircraft, registration RDPL-34233 for Pakse International Airport, Pakse, Laos. At or about 4 PM, Flight QV301 crashed while on final approach to Pakse International Airport killing all onboard. The Lao Ministry of Public Works and Transport said ''Upon preparing to land at Pakse airport the aircraft ran into extreme bad weather conditions and was reportedly crashed into the Mekong River. There were no news of survivors at this time”. The pilot has been identified as 56-year-old Young San. San had more than 30 years' of flying experience. He was a pilot for Royal Air Cambodge and had been employed Lao Airlines for more than 2 years. San received his flight training in Russia and later in France. The ATR 72 is a twin-engine turboprop short-haul regional airliner built by the French-Italian aircraft manufacturer ATR. The ATR 72-600 has a seating configuration of 68-to-74-seats. 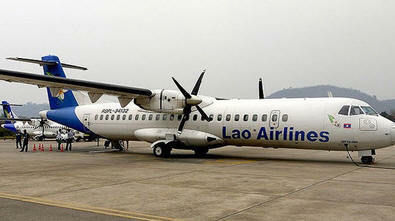 ATR reports the aircraft, registered under RDPL-34233, was (Manufacturing Serial Number) 1071, delivered from the production line in March 2013 to Lao Airlines. The Laos' Authorities will lead the investigation and will remain the official source of information. In line with the ICAO (International Civil Aviation Organization) Annex 13 convention, ATR will provide full assistance the French Bureau d'Enquêtes et Analyses (BEA), safety investigation authority representing the country of the aircraft manufacturer. A list of the 44 passengers was released by the airline at about 9pm. It described the passengers as five from Thailand, five from Australia, three from Korea, seven from France, one from the US, one from China, one from Taiwan, one from Canada and two from Vietnam. The names of the crew have not been released.